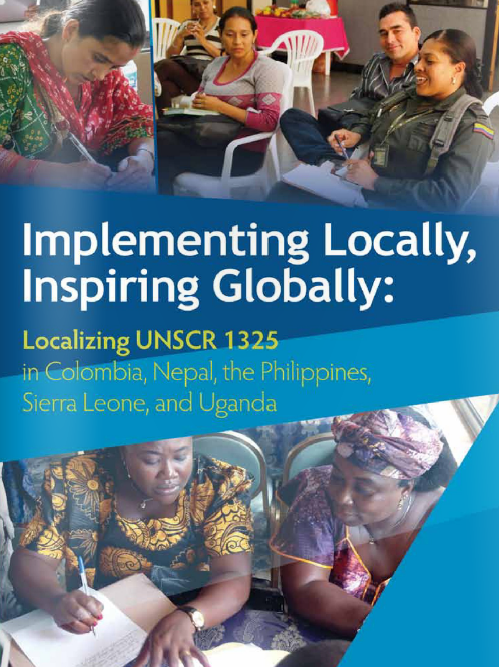 Published by the Global Network of Women Peacebuilders (GNWP), Implementing Locally, Inspiring Globally: Localizing UNSCR 1325 is a 126-page booklet focusing on the GNWP’s efforts to localize the UNSCR 1325 and 1820 National Action Plans (NAPs). These two resolutions focus on the importance of women’s participation in decision-making for conflict prevention, resolution, and recovery, especially in conflict-affected countries. So far, the program has made an impact on a variety of countries: Burundi, Uganda, the Republic of Congo, the Philippines, and Colombia. Encourage interaction between national and local government authorities toward implementation of the UNSCR 1325 and 1820 NAPs as well as their supporting resolutions. Facilitate cross-sectoral cooperation among civil society organizations, government agencies, UN entities, and other local actors toward implemention of the UNSCR 1325 and 1820 NAPs. Educate local government officials, religious leaders, local women leaders, and other community leaders on the UNSCR 1325 and 1820 NAPs as well as allow local communities to identify relevant aspects of the resolutions and create concrete actions on implementation of these aspects. Work toward global implementation of the UNSCR 1325 and 1820 NAPs as well as other supporting resolutions relating to women, peace, and security. In order to meet the objectives listed, the GNWP has two main components to its program. The first is the use of localization workshops, which educate community leaders such as mayors, governors, traditional leaders, police and military officers about the resolutions. Throughout the workshop, each participant identifies relevant aspects and works toward their implementation within his or her own community. The second component consists of two parts: creating training of trainers (ToT) workshops, and drafting and adopting localization guidelines. ToT workshops invite 20-25 participants for a 2-3 day workshop that allows them to become trainers of localization workshops. A team comprised of CSO experts, local authority workshop participants, and experts from key local ministries create guidelines to help local authorities mainstream relevant provisions for the resolutions will eventually be implemented locally and nationally. Nepal and Sierra Leone have produced guidelines for implementation. Localization workshops in Burundi resulted in a draft of the Burundi Guidelines for Integration of UNSCR 1325 and 1820 that is currently being field-tested. In the Republic of Congo, localization workshops in 2013 and 2014 encouraged police officers,teachers, and university professors to hold seminars on the resolutions. The Localizations of UNSCR 1325 and 1820 Program was mentioned in the UN Secretary General 2012 as “an important strategy that promotes implementation at sub-national and regional levels.” With this program, the GNWP hopes to include women in the decision-making of peace and security resolutions. The program is expected to impact numerous countries for years to come. For more information on the GNWP and its program, visit their website. For more information on the UNSCR 1325 and 1820 program, read the published booklet here. Image courtesy of the Global Network of Women Peacebuilders. ← Quick poll results- What would you like to see on our website?